Hi Yellow Songbird readers, I'm Andrea from Four Flights of Fancy and I'm so glad Kim invited me to be a guest blogger for Favorite Things Friday. With Spring in full force and Summer just around the corner, I thought I'd share a few of my favorite beauty products that are refreshing, fun and best of all, cheap! I find beauty products a great way to update a look without having to spend a ton of money, so i've always got my eyes peeled for a good deal on a fun new product. Thanks so much Andrea! 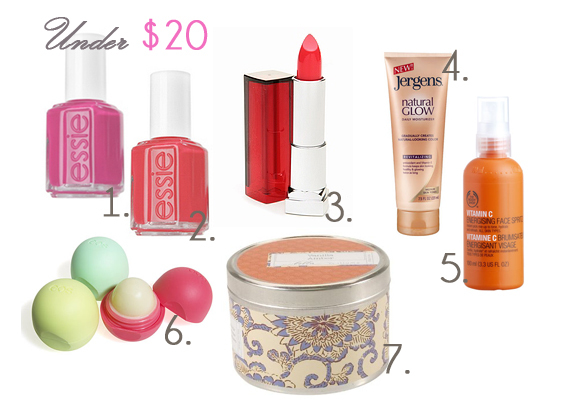 Such a fun change up and a perfect favorites list to get our skin ready for summer time! How fun-those EOS lip balms always look like they'd be wonderful to play with! What the what? That Vitamin C spray sounds amazing! I have been wanting to try that natural glow! Do you know if it works? I am so excited I found it today! I would be honored if you would stop by mine and tell me what you think! I can't wait to go back and read your older post and get to know you more!